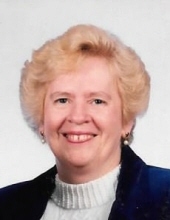 It is with great sadness that the family of Louise A. Proffitt announces her passing on October 8, 2018, at the age of 78 years. Louise will be carried in the hearts of her family, especially her husband Charles C. Proffitt, her three daughters, Heather (Craig Conklin), Deborah and Suzanne (Edward Moore), her brother Jack Chandler (Shirley) and sister, Mary Bausch (Fred). Her pride and joy were her grandchildren, Joshua (Jen), Danielle (Sean), Brittney (Nick), Casey, Zachary, Jason, Stacie and Matt. She was their biggest fan and rarely missed a game. A special love will always be with her great grandchildren, Colton and two more will be born to carry on the legacy this very week, Giovanni and Charlotte. Special to her also, were her cousins and dear friends. She was extremely devoted to her profession of Town of Sanford Town Clerk, Tax Collector and Registrar of Vital Statistics. She was recognized as one of the top NYS Field Hockey Officials, and was proud to be a member of the Order of the Eastern Star and Presbyterian Church. We will remember her most for her strength and tenacious will for Life. Calling hours will be held on Saturday, October 20, 2018 from Noon to 2:00 PM at the Presbyterian Church with a Service to follow. Local arrangements are by Zacharias Funeral Home, 78 Second St., Deposit, NY. To plant a tree in memory of Louise A. Proffitt, please visit our Tribute Store. "Email Address" would like to share the life celebration of Louise A. Proffitt. Click on the "link" to go to share a favorite memory or leave a condolence message for the family.